Curry Paradise has been discussed on local blogs for a while but, up to now, it’s one of the handful of restaurants without our review. It describes itself as a premium Indian takeaway but it also has an attached restaurant. The place is small and classy – linen tablecloths but paper napkins. The class is also in the choice of white plates which are indented so the inner square is slightly off centre – fine when sober but I imagine not so much after a couple of beers. But in good taste even the salt and pepper came in white slanting towers. The vase of flowers was a single green spray of chrysanthemums to finish the stylish decor. So how did we know it was an Indian restaurant? The entrance was shaped like a dome, there was a picture of Buddha on the wall together with a wall hanging and a sitar. No flock wallpaper, no dim interior – it was light and airy with interesting lamps hanging over each table. We cannot now remember what this shop was before it was a restaurant. It is next door to the popular Asmara but is completely the opposite. 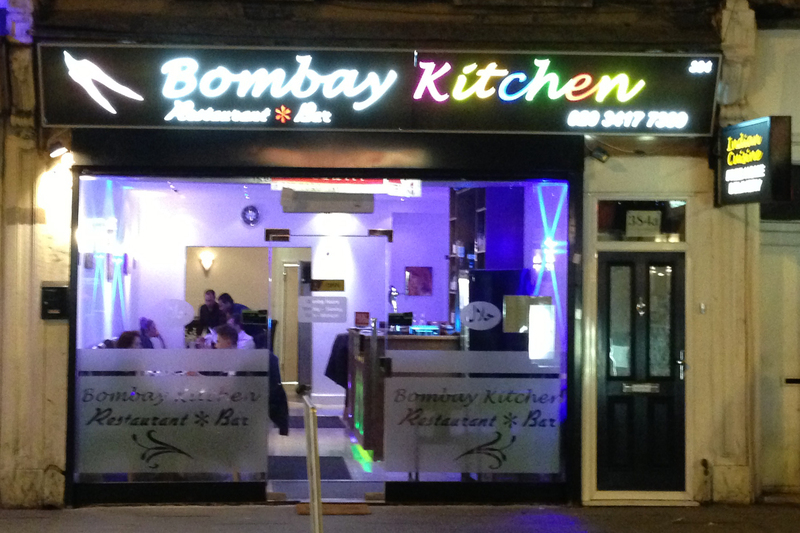 Asmara is dark and Bombay Kitchen has all lights blazing with a glass frontage. This is not the traditional Indian in terms of décor There is no flock wallpaper for one thing. It describes itself as contemporary and has a clean design with a small open bar and chairs and table that match – unlike many places in the heart of Brixton. There is piped music and it is Indian again unlike the musak that most of the flock wallpaper brigade provide for its clientèle.